Guangzhou Automobile Motor Corporation or GAC Motor is finally in the Philippines after it appointed Legado Motors, Inc. (LMI) as its exclusive distributor. During the launch, Legado Motors unveiled a wide range of passenger cars and SUVs, all of which are now available for viewing at the brand’s first-ever showroom located at 1800 Ortigas Avenue, Pasig City (in front of Medical City). Its initial product offering is composed of the GA4 sedan (1.5-liter MT and 1.3 turbo AT), GS4 subcompact SUV, GA8 executive sedan (available in both 4- and 5-seater variants), GM8 7-seater MPV, and the GS8 SUV (available in both 4x2 and 4x4). A fairly young automotive company, GAC was founded in 2008 in Hualong Town, Guangzhou, China. Since then, the brand has grown to have 4 assembly plants all located in China: Guangzhou, Huangzhou, Yichang, and Xinjiang. Integrating exceptional quality and excellent customer experience, all GAC Motor vehicles received 5-star ratings in China Automotive Technology and Research Center’s China-New Car Assessment Program (C-NCAP) rash test, making this prestigious brand the only full five-star safety rating car in China. 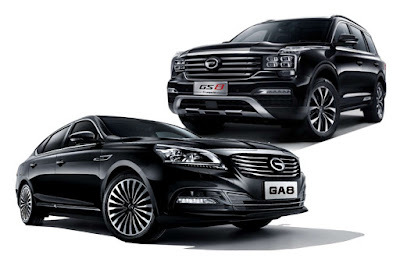 Moreover, GAC Motor ranked number 1 in the J.D. Power’s Initial Quality Study for six consecutive years from 2013 to 2018. GAC Motor has also managed to establish a presence in the Middle East, South America, and Africa. As such, the Chinese brand strives to a global leader with a goal to produce and sell 1 million vehicles by 2020. Check out the prices of GAC Motor products here.